This website belongs to Chrysalis Home Needs Pvt. Ltd. (hereinafter referred to as "Home Needs Online/we/our/us"). As a user of this website (hereinafter referred to as "you/your"), you acknowledge that any use of this website including any transactions you make ("use/using") is subject to our terms and conditions below. 1.1 The Seller is Chrysalis Home Needs Pvt. Ltd, Old No.4, New No.5, Rama Naicken Street, 2nd Floor, Nungambakkam, Chennai - 600034. Company Identity Number: U51900TN2013PTC089597 and VAT Registration Number 33801503879. 1.2 We reserve our right to change these terms and conditions at any point of time, but such changes will be posted on the website and it will take effect as and when it is posted on the website. It is your responsibility to read the terms and conditions on each occasion you use this website and your continued use of the website shall signify your acceptance to be bound by the latest terms and conditions. 1.3 All orders and purchases made on the www.homeneedsonline.com will be governed by the terms and conditions applicable to that product. 1.4 Certain website services will require registration and subsequent access to those services will be subject to an approved login name and password ("Password Details"). Information that you provide on this website must be accurate and complete. All Passwords Details are accepted and may be withdrawn at our sole discretion and are exclusive to you and non-transferable and must be treated as strictly confidential at all times. In the event that you have any concerns regarding your Password Details or become aware of any misuse, kindly alert us immediately. 2.1 The display of products on our website is an invitation and not an offer to sell those goods to you. 2.3 The 'confirmation' stage displays the order related information. Following this, we will send an order acknowledgement email detailing the products you have ordered. Please note that this email is not an order confirmation or order acceptance from Home Needs Online. 2.4 Acceptance of your order followed by delivery concludes that particular transaction unless we have notified you that we do not accept your order or you have cancelled the same. 2.5 We do not file details of your order on the website and therefore request you to maintain a copy of the same for reference. In case you wish to view the details of previous orders please Contact Us. 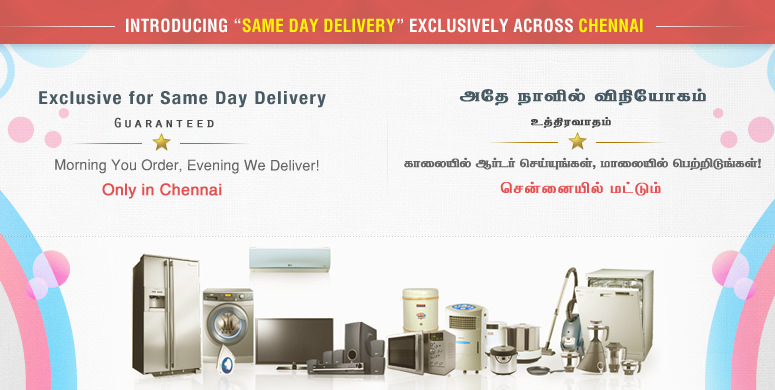 3.1 This website is only for delivery of products to customers in India. All goods must be signed for by an adult aged 18 years or over at the time of delivery. The signature of the person accepting delivery at the delivery address will be proof that delivery has been received by you or the person to whom the order is addressed. If no one is available to accept the delivery you will receive a card to advice that a delivery has been attempted. 3.2 Delivery charges and estimated time scale are specified in the Shipping Info section and also when you place an order. We make every effort to deliver goods within the estimated time period; however delays are occasionally inevitable due to unforeseen factors. Home Needs Online shall be under no liability for any delay or failure to deliver the products within estimated time scales. 3.4 Risk of loss and damage of products passes to you on the date and time when the products are delivered or on the date of first attempted delivery by us. 3.5 Cash on Delivery orders are applicable only if they adhere to the minimum and maximum order value as mentioned in point no. 4.7 below. 4.1 We accept payment through credit/debit card and Net Banking. Payment is accepted only after availability of stock is verified. In the event that we are unable to supply the goods, we will inform you at the earliest and a full refund will be given in case you have already paid for the goods. 4.2 To ensure that your credit, debit card or Net Banking is not being used without your consent, we will validate name, address and other personal information supplied by you during the order process against appropriate third party databases. By accepting these terms and conditions you consent to such checks being made. In performing these checks, personal information provided by you may be disclosed to a registered Credit Reference Agency which may keep a record of that information. You can rest assured that this is done only to confirm your identity, that a credit check is not performed and that your credit rating will be unaffected. All information provided by you will be treated securely and strictly in accordance with the IT Act. 4.3 The price you pay is the price displayed on this website at the time we receive your order apart from the following two exceptions: a) While we try and ensure that all prices on our website are accurate, errors may occur. If we discover an error in the price of goods you have ordered we will inform you as soon as possible and give you the option of reconfirming your order at the correct price or cancelling it. If we are unable to contact you we will treat the order as cancelled. If you cancel and you have already paid for the goods, you will receive a full refund. 4.6 All prices are shown in Indian Rupees and include VAT (where applicable) at the applicable current rates but exclude delivery charges, unless expressly stated otherwise. 5.1 Home Needs Online offers warranty to repair [if possible] or replacement if not possible to repair, in respect of any manufacturing defect in the product within the warranty period as stipulated in warranty conditions of that specific product. 5.2 If, for any reason, you wish to do so you have the right to cancel any order you have placed within 30 minutes from the time of placing an order either by email or telephone. The amount paid will be refunded to you in 28 days. 5.2 Sometimes the product specifications may change, in which case we will do our best to offer you a similar alternative. We may experience problems with the supply of certain products and may therefore supply a substitute of the same or better quality at the same price. If you are not happy with the replacement or substitute you can return it immediately. Where applicable, you may cancel your order in accordance with your rights under the Law. 5.3 All sizes and measurements are approximate but we strive to make sure that they are as accurate as possible. 5.4 The shipping within India is free at the moment as an inaugural offer. 5.5 The acceptance of the contract with Home Needs Online has occurred only when the product is shipped to you. 6.1 You acknowledge and agree that trademark Home Needs Online (Work & Device), copy right of the product's design and all other intellectual property rights shall vested in us. 7.1 Home Needs Online will use certain chosen process to verify the accuracy of any information on the site but makes no representation or warranty of any kind express or implied statutory or otherwise regarding the contents or availability of the site or that it will be timely or error-free, that defects will be corrected, or that the site or the server that makes it available are free of viruses or bugs or represents the full functionality, accuracy, reliability of the website. Home Needs Online will not be responsible or liable to you for any loss of content or material uploaded or transmitted through the website and Home Needs Online accepts no liability of any kind for any loss or damage from action taken or taken in reliance on material or information contained on the site. 7.3 Home Needs Online aggregate liability (whether in contract, tort or otherwise) for loss or damage shall in any event be limited to a sum equal to the amount paid or payable by you for the product(s) in respect of one incident or series of incidents attributable to the same clause. 7.4 We take all precautions to keep the details of your order and payment secure, but, we cannot be held liable for any losses caused as a result of unauthorized access to information provided by you. 7.6 Our obligations under these terms are suspended for the period that the Force Majeure Event continues, and we will have an extension of time to perform these obligations for the duration of that period. We will take reasonable steps to bring the Force Majeure Event to a close or to find a solution by which our obligations under these terms can be performed despite the Force Majeure Event. 8.1 Any gifts / promotional schemes offered in this site are subject to the availability of the stocks. 8.2 Purchase under these schemes will have to be in 'one single purchase' / 'order number' and cannot be claimed otherwise. 8.3 In case of any and all disputes arising out of this, the decision of the management of Home Needs Online will be final and binding. 8.4 No refunds or cash reimbursement will be made against the promotions / gifts and offer. 8.5 Prices are subject to change without prior notice. 9.1 The contract between us shall be governed by the laws of India and any dispute between us will be resolved exclusively in the Indian law. 9.2 We have selected our products on the basis that they will be used for domestic use only, if you are planning to use them for business purposes please make sure that you are covered by the appropriate insurance. Where you decide to use the products in the course of a business, we exclude those warranties and conditions relating to fitness for a particular purpose. Our maximum liability to business users arising out of or in connection with the products shall be limited to the replacement value of the product in question (except in the case of death or personal injury caused by our negligence or in respect of fraud). In relation to business users, we do not accept liability for the fitness of goods for business purposes, nor do we accept liability for loss of use of the item nor any loss over and above the cost of the item in the event of a claim for breach of warranty or condition. 9.3 Home Needs Online shall be under no liability for any delay or failure to deliver products or otherwise perform any obligation as specified in these terms and conditions if the same is wholly or partly caused whether directly or indirectly by circumstances beyond its reasonable control. 9.4 You may not assign or sub-contract any of your rights or obligations under these terms and conditions or any related order for products to any third party unless agreed upon in writing by Home Needs Online. 9.5 Home Needs Online reserves the right to transfer, assign, novate or sub-contract the benefit of the whole or part of any of its rights or obligations under these terms and conditions or any related contract to any third party. 9.6 If any portion of these terms and conditions is held by any competent authority to be invalid or unenforceable in whole or in part, the validity or enforceability of the other sections of these terms and conditions shall not be affected. 9.7 No delay or failure by Home Needs Online to exercise any powers, rights or remedies under these terms and conditions will operate as a waiver of them nor will any single or partial exercise of any such powers, rights or remedies preclude any other or further exercise of them. Any waiver to be effective must be in writing and signed by an authorized representative of Home Needs Online. 9.8 These terms and conditions including the documents or other sources referred to in these terms and conditions supersede all prior representations understandings and agreements between you and Home Needs Online relating to the use of this website (including the order of products) and sets forth the entire agreement and understanding between you and Home Needs Online for your use of this website. The information contained in this website is for general information purposes only. The information is provided by Chrysalis Home Needs Pvt. Ltd and while we endeavour to keep the information up to date and correct, we make no representations or warranties of any kind, express or implied, about the completeness, accuracy, reliability, suitability or availability with respect to the website or the information, products, services, or related graphics contained on the website for any purpose. Any reliance you place on such information is therefore strictly at your own risk. Ultimere scheme is run exclusively by Home Needs Online for their customers. This is an advance instalment scheme. Ultimere scheme must be paid for 12 consecutive months from the month of joining. The instalment denominations varies according to the scheme and are in the likes of Rs. 5000/- or Rs. 7500/- every month. Customers are required to indicate their choice of monthly instalment amount at the time of filling the Registration form. These instalments amounts are fixed after having chosen at the time of Registration. During the course of this plan it cannot be changed under any given circumstances. All monthly instalments have to be paid between the 5th and the 10th of every month or within the specific window indicated during the launch of the scheme or that particular batch. In order to support our customers, Reminder e-mails, SMS's or calls would be provided by Home Needs Online as and when possible. Monthly instalment should be made by Debit/Credit Card or Net Banking only. The instalments cannot be carried over or paid in advance either. The customer will be sent an " Authentication Receipt Certificate " accepting his/her payment to the registered Email ID as and when the payment is made. Apart from this, the customer?s can also login to their account and check their Statements any time during their active period of the scheme. In case the customer fails to make his/her monthly instalment, they automatically discontinue from the Scheme and will not be eligible for any bonuses. Customers are advised to ensure / double-check that all the payments made by them are correctly shown in their respective Home Needs Online account. in case of any discrepancies, it must immediately be brought to the notice of the management of Home Needs Online through admin@homeneedsonline.com for necessary rectification. Discontinuation of the scheme will not allow the customer to be eligible for any bonuses. The participating customer is entitled to redeem his/her Home Needs Online account value only after the 13th month of joining the scheme and only if he/she successfully completed the scheme abiding to all its Terms and Conditions. Advancement of the maturity date is not permitted. The Bonanza will be 20% on the successful completion.. The customer can redeem only against any and all products purchased/shopped from www.homeneedsonline.com. The purchasing of products against this scheme can be done only between the 13th month until the 24th month of joining this scheme. Purchases can be made under any denominations and can be made through multiple purchases. In case the customer doesn't make his purchase during the validity period of the plan the customer will have to request for a new fulfilment and it would be approved by the Home Needs Online Management on a case to case basis. In any case, if the customer is not satisfied or happy to shop with Home Needs Online during the 13th month or any time after the instalments. They will be refunded in full, whatever paid until, with no additions, deductions, or charges from Home Needs Online after the 13th month. Any customer who decides to discontinue in between the payment period, will have to wait until the Scheme matures (13th month) and will be refunded only the Principle paid and will not be eligible for any bonuses or additions. The customer will be refunded in full (Principle Paid till date of discontinuation) with no deductions or additions. If there is any form of charge back from the bank, the respective customer will not be able to continue or be a part of this scheme. If in case any Fraudulent modes of payment are registered, the customer involved in such cases will automatically be discontinued from this scheme. Home Needs Online will ensure availability of all products and ranges during the 13th and 24th month for customers to avail and shop to their benefit, subject to the products availability at that point of time. This particular scheme is unique and will not be linked to any future schemes. It is at the sole discretion of the company to alter, amend, modify, add or delete any of the terms and conditions at any point of time without notice. Any and all discrepancies arising out of this scheme will be subject to the final decision made by the management of Chrysalis Home Needs Private Limited. All legal issues are subject to Chennai Jurisdiction only. 1. This Offer can be availed only when payments are made by the Buyer through the PayUMoney payment option on the payment page of the Seller's website. To avail the Offer, Buyers shall be required to register themselves on PayUMoney. 2. The Buyer will receive a cash-back for all payments made through PayUMoney. The cash-back will be credited back to the Buyer's PayUMoney Wallet, which may then be used for paying for goods or services provided by PayUMoney's Seller partners. 3. The maximum cash-back per transaction will not exceed Rs. 50/-. 4. The cash-back amount credited to the Buyer's PayUMoney Wallet shall be valid for a period of one year. 5. PayU shall not be liable for any hacking or unauthorized use of the Buyer's PayUMoney Wallet and it shall be the sole responsibility of the Buyer to ensure privacy and confidentiality of Buyer's PayUMoney account details. 6. The Offer can be availed multiple times. 7. In event the Buyer initiates a refund in respect of a transaction, the amount of cash-back credited to the Buyer's PayUMoney Wallet shall be debited. In event of initiation of a refund, where the balance credited to the Buyer's PayUMoney Wallet as cash-back has been utilized by the Buyer towards purchase of goods/services, the Buyer's PayUMoney Wallet shall be debited by the amount of cash-back and in case the PayUMoney Wallet has zero balance, the PayUMoney Wallet shall show a negative balance equaling the amount of cash-back. Where the cash-back is utilized towards a new transaction and a refund is initiated with respect to such new transaction, the cash-back from the original transaction shall be credited back to the PayUMoney Wallet while the cash-back from the new transaction shall be debited from the PayUMoney Wallet. 8. PayUMoney reserves the right to, at any stage and at its discretion, modify/change or alter this Offer. PayUMoney also reserves the right to modify/change all or any of the terms applicable to this Offer and to discontinue this Offer without assigning any reasons or without any prior intimation whatsoever. 9. PayUMoney reserves the right to disqualify any Buyer from the benefits of this Offer, in case of any fraudulent activity/suspicious transactions. 10. In case of any disputes, PayUMoney's decision will be final. 11. In addition to the above, this Offer is also subject to PayUMoney general terms & conditions available on www.payumoney.com. 12. Terms & conditions of the respective PayUMoney Seller partner shall also apply. 3. Flat 500 off on any Product /Cart. No minimum Cart Value. 6. The coupon is applicable only for confirmed/online orders and will not applicable on COD orders. 9. The offer can be withdrawn at any time as per the company’s discretion. 10. In case the product goes out of stock, the company has the right to refund the order in terms with the refund policy mentioned on http://www.homeneedsonline.com/page/terms-conditions.html under point number 5. We recommend you print out a copy of these terms and conditions for future reference. If you have any questions regarding the Home Needs Online website, please see the Customer services section for more information and full contact details. Terms and conditions pertaining to "Set Top Box for LCD and LED TVs"
1. The cost includes - STB, VC card, Dish antenna, installation, subscription as per the pack chosen by the customer, 10 meters of cable. 2. Extra cable required in addition to 10 meters will be charged @ Rs.12 per meter. 3. The SET TOP BOXES activated in this offer will carry a lifetime warranty. 4. In case the STB remains de-active for 30 days or more , the lifetime warranty gets lapsed & in the event of further non recharge by the customer, Dish TV shall recover the STB from the customer. 5. The customer need not to pay anything at the time of booking. 6. Entire money will be collected by the installation team after Installation & Activation. 7. Following Documents (self attested by the customer) will be required at the time of Installation & Activation (to be provided by the customer). - Proof of Address, where the connection is being installed. - SaF Form (Installer will carry). - Dish TV Agreement(Installer will carry). 8. In case customer is not able to furnish the above documents, dishtv shall not be able to install the product under this special offer. In that case he may avail normal market offer. 9. Installation of connection under this offer is solely at the discretion of dishtv. 10. Offer cannot be clubbed with any other offer. 11. All disputes are subject to Delhi jurisdiction. 1. Offer valid for both COD and Online payment. 2. Contract between Buyer and Seller will come into effect only after the order is shipped. 3. Coupons valid as per validity period indicated in coupon or accompanying email. 4. Coupon dispatch via email on same day ( only business days ) for prepaid orders and next business day for COD orders. 5. Coupons valid only for Same Day Delivery for respective cities/towns , where scheme is available. 6. Cancellations and refunds will be as per the respective policies of Seller. 7. Refund amount due to cancellation of order on nonavailability of stocks will be equivalent tothe amount paid by the customer. 8. TAJ gift voucers will be despatched after 2 days from acceptance of delivery. 9. TAJ vouchers valid as per the terms and conditions of TAJ. 10. Discretion to discontinue / amend the offer lies solely with Chrysalis Home Needs Online Pvt Ltd.
11. All other terms and conditions as per HOMENEEDSonline website. 12. Any and all disputes subject to final decision by the management of Chrysalis Home Needs Online Pvt Ltd.
1. LOWEST PRICE GUARANTEE - comparison is done only with few major ecommerce websites as listed. Any other website is outside the purview. 2. Price up-date is done once in 1 hour. Any price change in the meantime , will not be reflected. 3. Price comparison is done through an associate , recognized third party comparison website. In the event of any mismatch in prices or data, Home Needs Online will not be responsible for the same. 4. Any and all disputes subject to final decision by the management of Chrysalis Home Needs Pvt Ltd.
5. All legal issues are subject to Chennai Jurisdiction Only. 6. Any other existing schemes/offers will not be available under 'Lowest Price Guarantee' offer.